In late September, there are far fewer flowers for the bees and birds to visit — the bees to collect those last remaining dregs of pollen and nectar before the snow flies, and the birds to harvest what seed might still be remaining in flowers that bloomed more than two months ago. Giant Hyssop is a favorite of the bumblebees these days; its profuse blooms always attract a variety of pollinators, especially when the sunshine can get through the clouds to warm up the air a little. The bumblebees generally start at the bottom of the flower head and spiral around upward walking over some flowers, poking their antennae into others, and every now and then inserting their entire head into a particular flower to glean whatever nectar lies at the bottom of the floral tube. When the bee gets to the top of the raceme, it makes a short flight over to the next one, beginning again at the bottom and working its way up to the top. Looks like better foraging on the hyssop flowers than this very attractive but apparently unrewarding purple flower that I planted but have no idea what it is. This isn’t a tandem bumblebee hook-up; the one on top (right side up) is actually flying toward the camera, away from the bee that was originally foraging on that stem. Overlooking this busy bumblebee activity was a mixed flock of Goldfinches, House Finches, and White-throated Sparrows, all of which were much more interested in the seeds left in the wildflower garden than the flowers there. 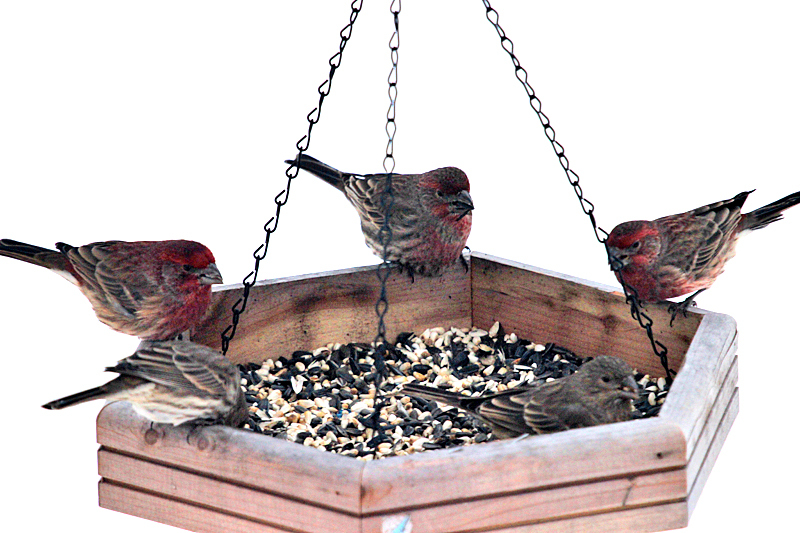 Their bright red color has faded to a rosy hue with the fall feather molt. This little male spent several minutes picking out lilac seeds from dried up remnants of flower clusters. A juvenile White-throated Sparrow watched what the House Finches were eating, but didn’t seem interested. 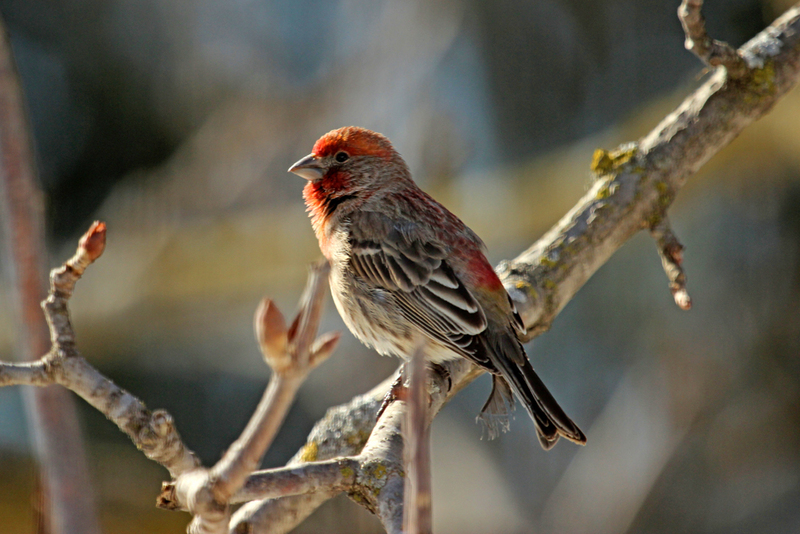 (fill in the blank…) It’s time for a science nerd post on Backyard Biology, and I can’t resist summarizing an article I read in Forbes magazine (yes, Forbes does publish very well-written scientific articles) about why birds are red. Red is the color of … many species of birds. In fact there are over 100 species of birds with a little or a lot of red plumage just in North America. The first page of a google search for “red birds” shows a lot of images of cardinals, but many other species with red plumage as well, such as scarlet tanagers, painted buntings, red crested cardinals, flamingos, scarlet macaw, house finch, red crossbill, etc. 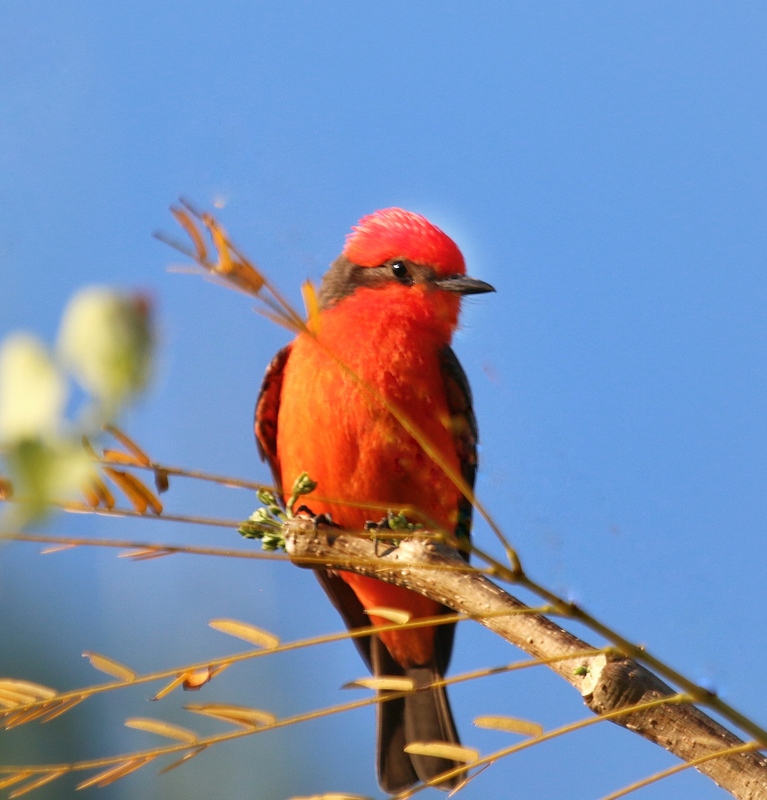 But there is no inherent red pigment that colors those feathers that rich, ruby hue — so how do birds manage to achieve their rosy glow? 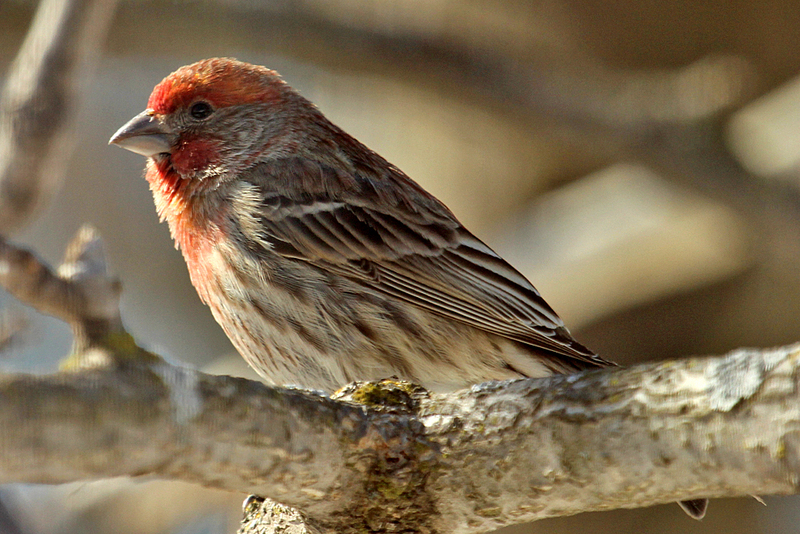 Male House Finches show some red in the winter, but are brilliantly red on head and breast this spring. 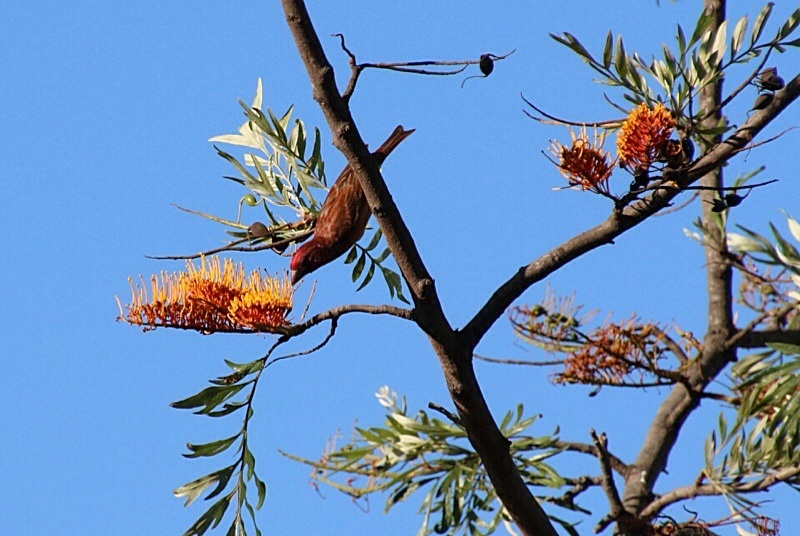 As I have discussed in earlier posts, birds require beta-carotene (a yellow pigment) in their diet, in order to synthesize the red “canthaxanthin” pigment that reflects red light. The newly discovered enzyme responsible for the conversion from yellow carotene to red canthaxanthin pigment is one of a group of liver enzymes responsible for detoxification of ingested contaminants. That’s the first requirement of achieving a red color. If the enzyme is also produced in the skin while feathers are forming, then they achieve their full red color, and apparently, the more active the enzyme, the more intense or widespread the red. That enzyme activity during differentiation in the skin is the second requirement for achieving a red color. 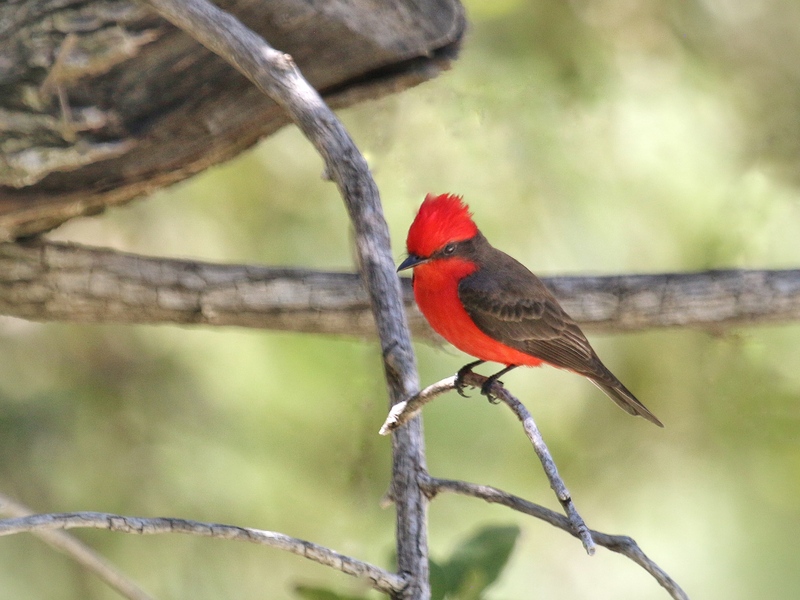 So…REDness could be an honest signal (or indicator) of the health and vigor of the individual bird, an important cue for females seeking the most fit mate. Red is the color of the most fit males. the landscape recently. Gray is not my favorite color. I need something bright in my view, and a little sunshine here wouldn’t hurt. Flat light may be great for taking photos that lack offending shadows, but it really dulls the color of what I know to be brightly plumaged birds. 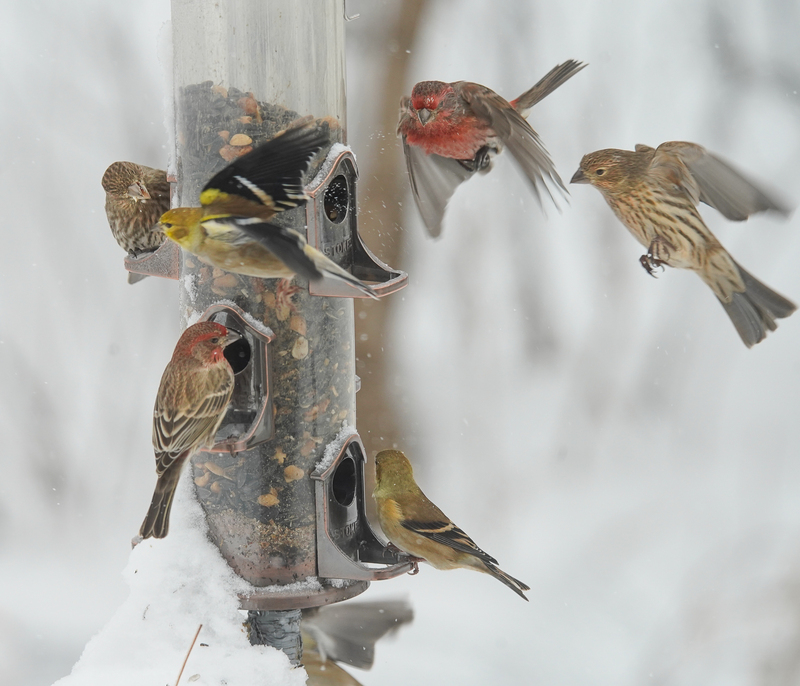 So, here’s the best I could do with the colorful House Finches that stopped by the feeder the other day. 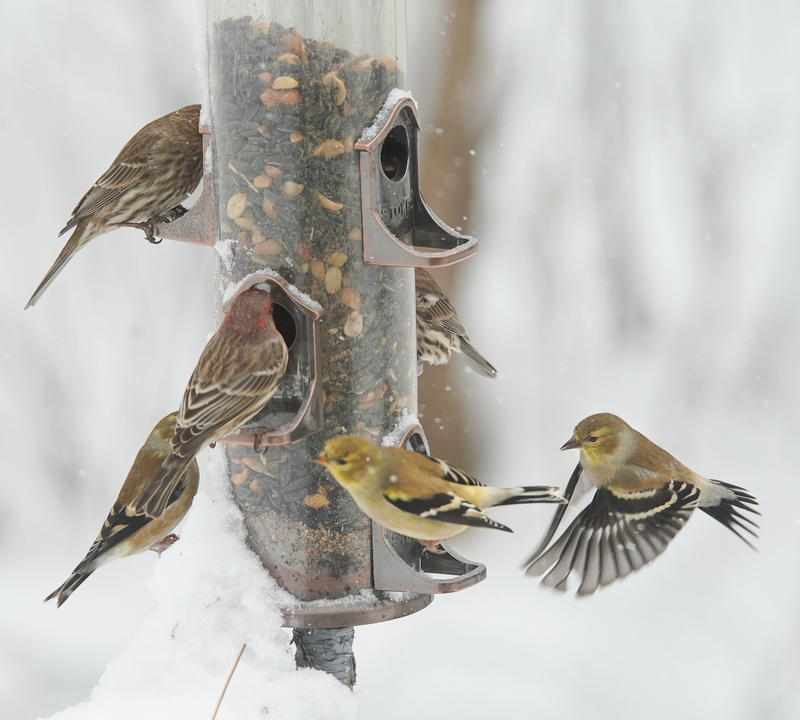 A small flock of House Finches munched up the sunflower seeds, and then quickly disappeared. 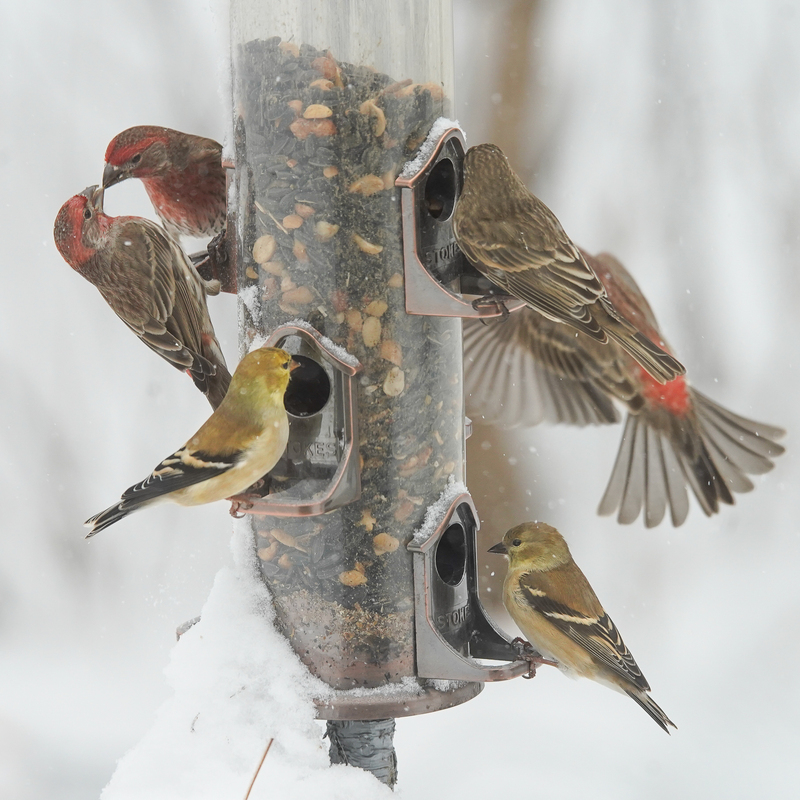 There seems to be quite a bit of variation in the red color of the male House Finches. 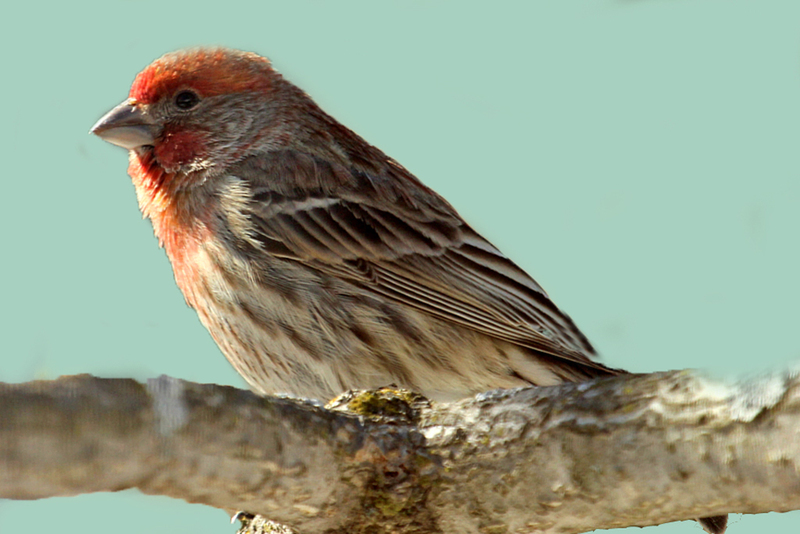 Like Cardinals, male House Finches depend on the carotenoid pigments in their food during their fall molt to brighten up the striking red color in their head and breast feathers. 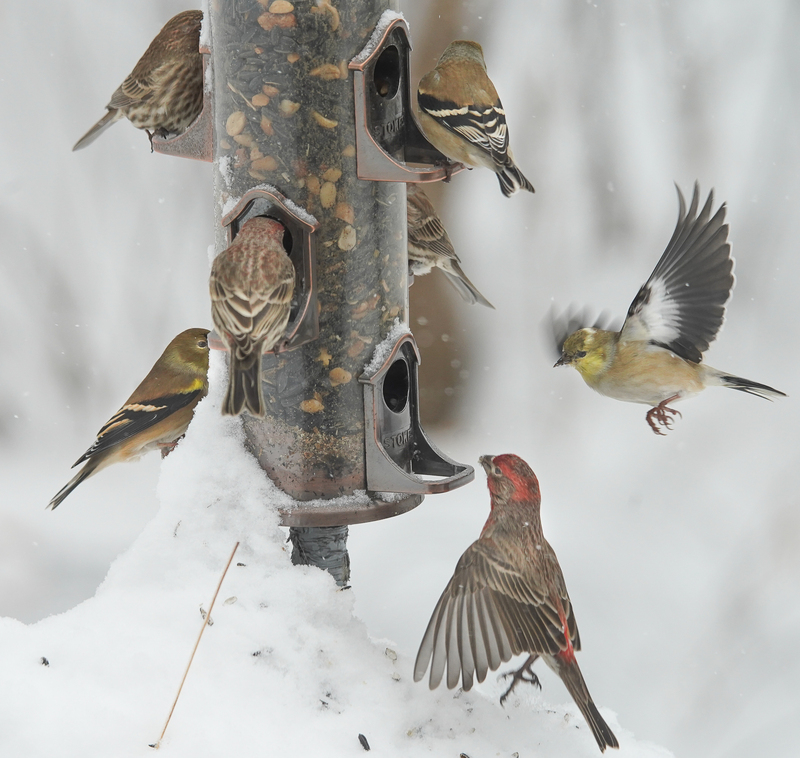 Female House Finches usually prefer the reddest males, so like Cardinals, the fittest males are the ones that can find the best food and are thus the most colorful. 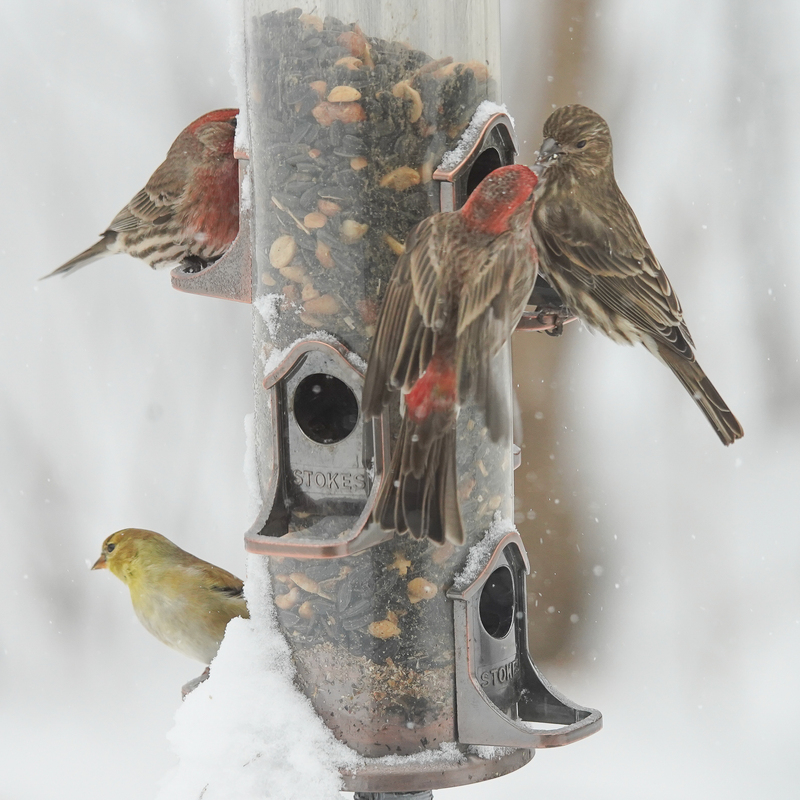 If you see orangey tinted House Finches at your feeder, that bird might be a non-breeder next spring. 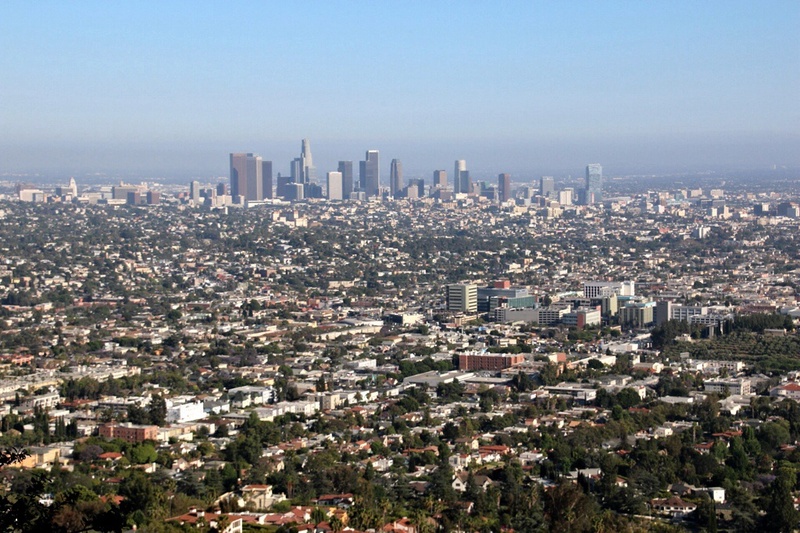 We visited the Griffith Park observatory in Los Angeles for a view of the city and a short wildlife hunt. 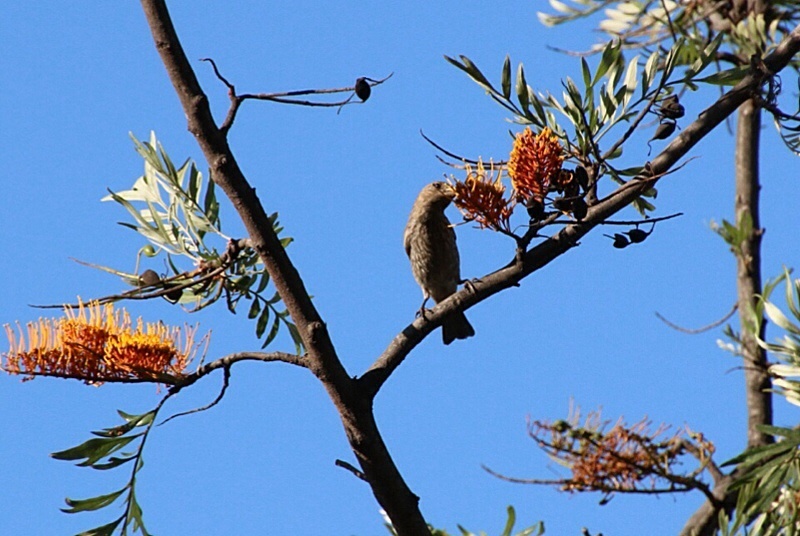 A tree we didn’t recognize seemed to be particularly attractive to a wide variety of birds: acorn woodpeckers, house finches, Anna hummingbirds, to name a few. 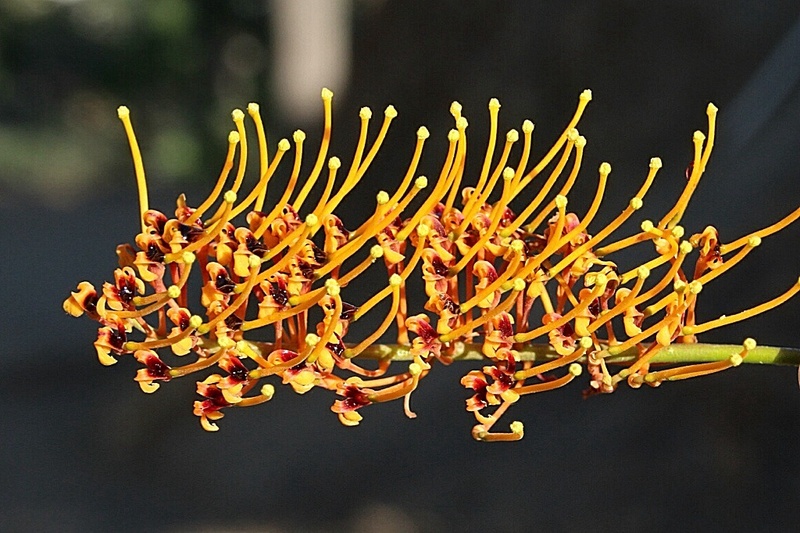 Strange looking flowers, full of sticky globs of glistening nectar residue. 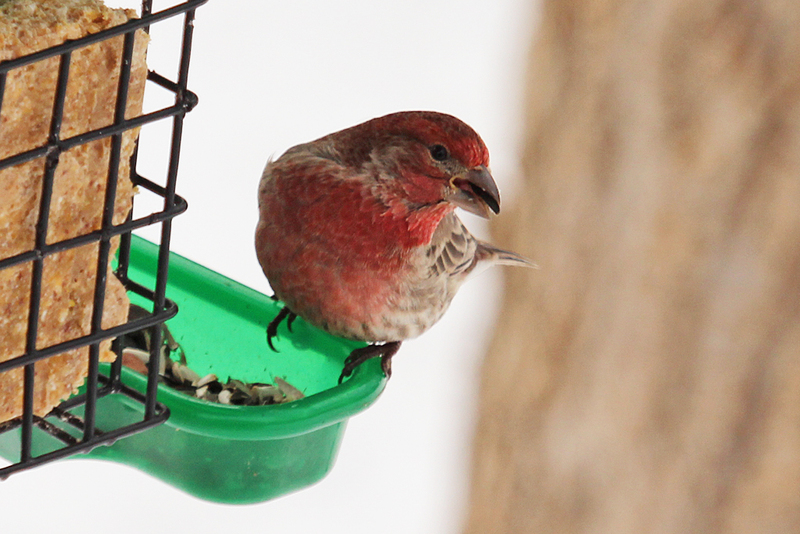 The House finches were really enjoying this sticky treat. 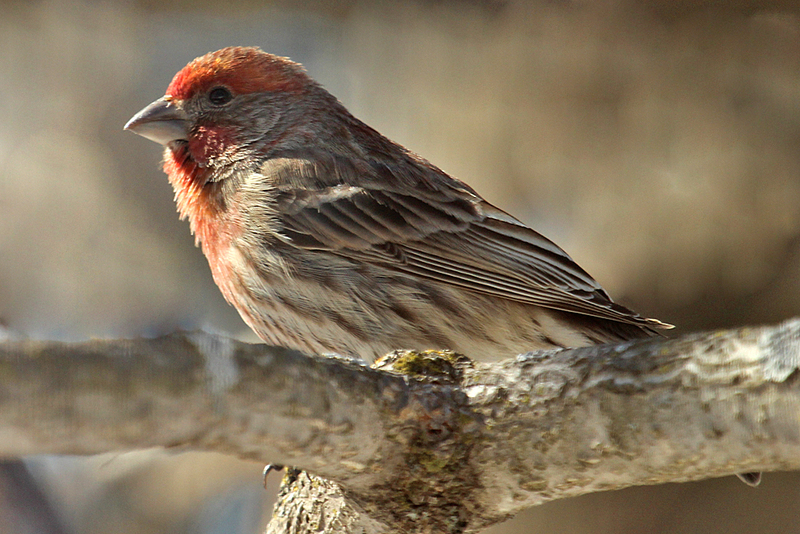 Notice how this male House finch keeps his distance from the sticky stuff. 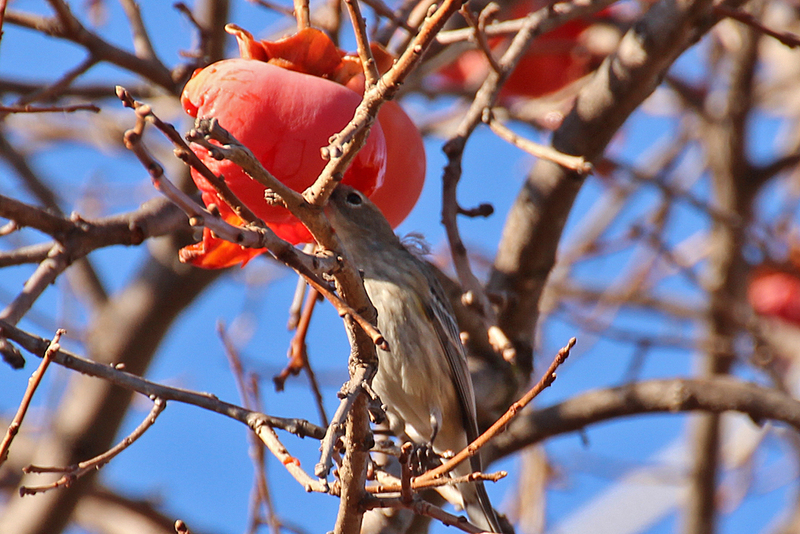 A female House finch delicately sampled the gooey flowers. 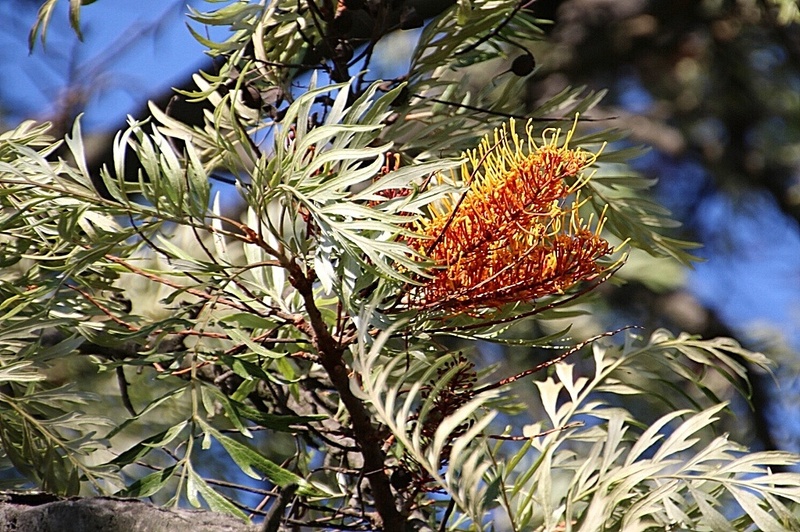 The most likely candidate for this mystery tree was some kind of eucalyptus, but I couldn’t find one that matched these leaves and flowers. So it’s a mystery…any ideas? It’s often difficult to separate the subject being photographed from its background, especially when that background involves numerous tree branches and leaves that distract glaringly from the subject. 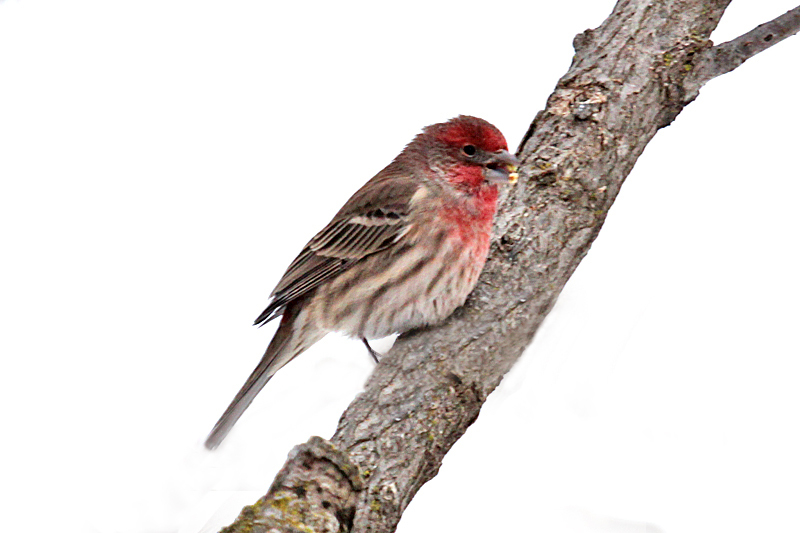 A male House Finch posed for several minutes on the tree outside my porch window, but even though I thought he was in the clear, the photos looked cluttered with excess numbers of twigs, stems, and branches. Really not that attractive a photo, but a starting point. I like the early morning light on his very red head feathers. So I decided to improve on getting rid of unwanted features in photos, and put some of the power of Photoshop Elements to work that I hadn’t used much. Cropping helps, but doesn’t get rid of all of the distracting elements. There is too much confusion of light and dark in the background. Cloning and blurring parts of the background helps somewhat. But the bird doesn’t really stand out from this background the way I would like. Replacing the entire background with a muted blue sky helps the bird stand out. But this sort of looks fake. I had to do some minute cloning and repairing of his feathers that got axed by the blue sky maneuver — can you tell where? I’m not a fan of highly manipulated photos, but sometimes it’s fun to see what it could look like, with better shooting conditions. Which type of photo do you like best? 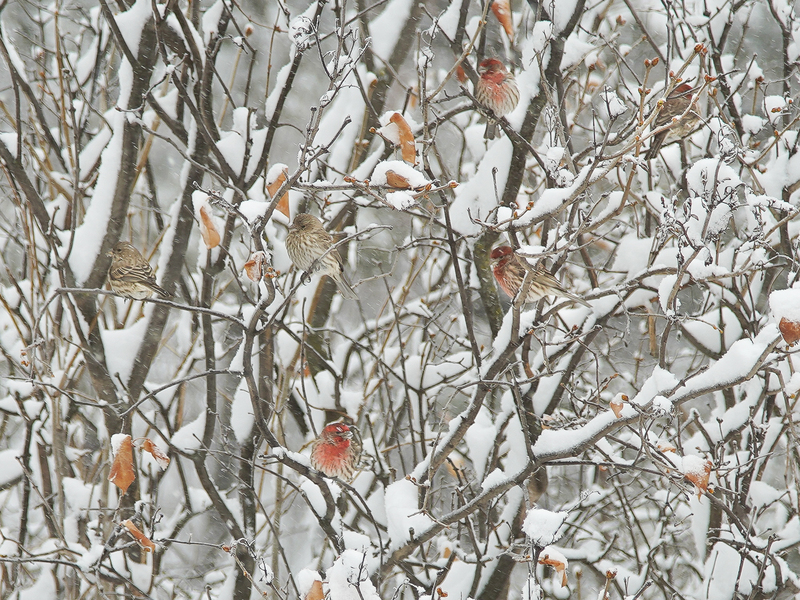 The House Finches are definitely feeling spring-ey and are singing up a storm, even if the cardinals are just half-hearted about it. 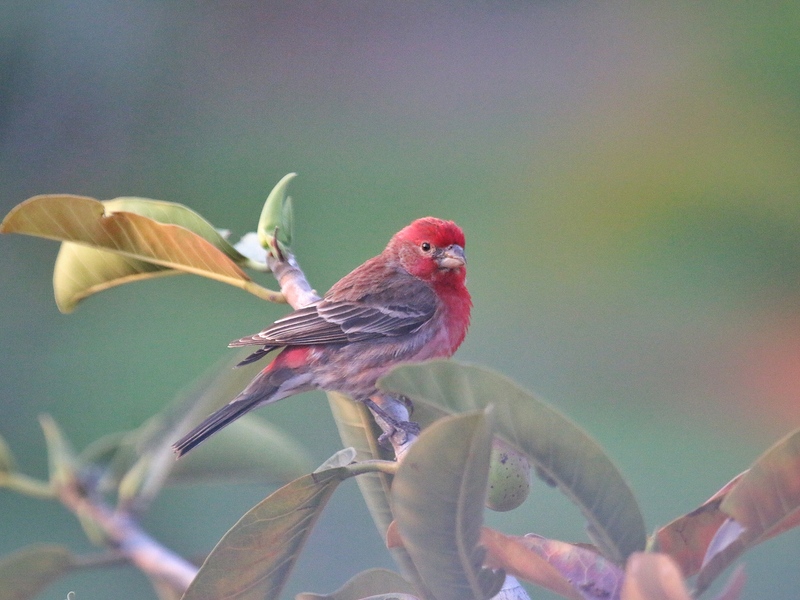 The male finches seem particularly bright red these days, as their hormones rev up. I assume the outer duller portions of their fall molted feathers have finally worn off to show their rosy glow. This guy just couldn’t quit posing as he snacked on sunflower seeds. Maybe he was just showing off for the ladies. 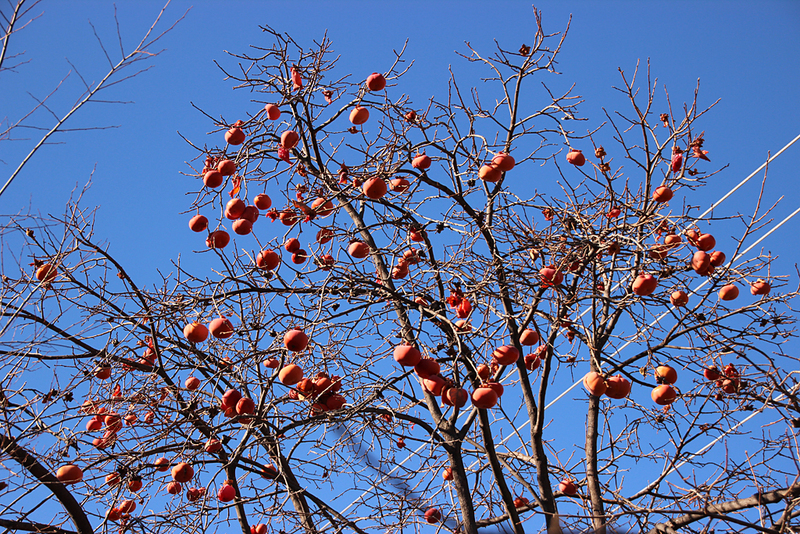 Out in my mother-in-law’s California backyard, the persimmon tree is drooping with fruit. 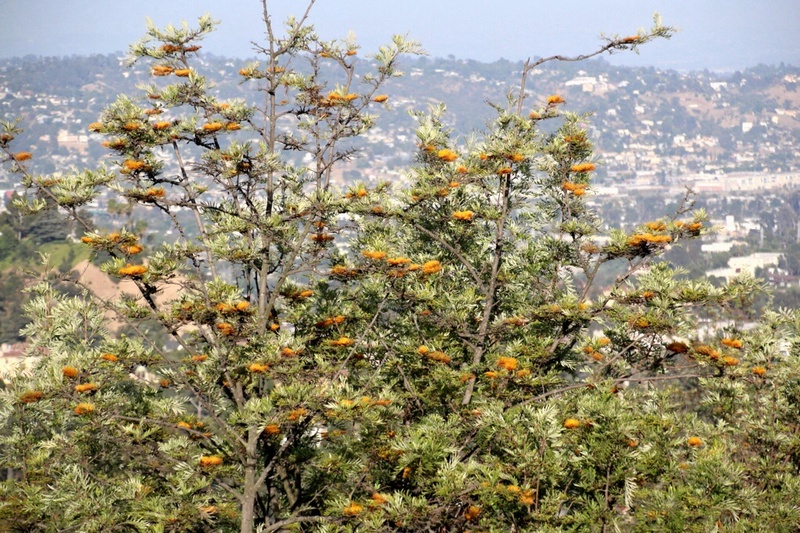 The tree is deciduous in the winter, leaving just the bright orange globes hanging from rather spindly stems. 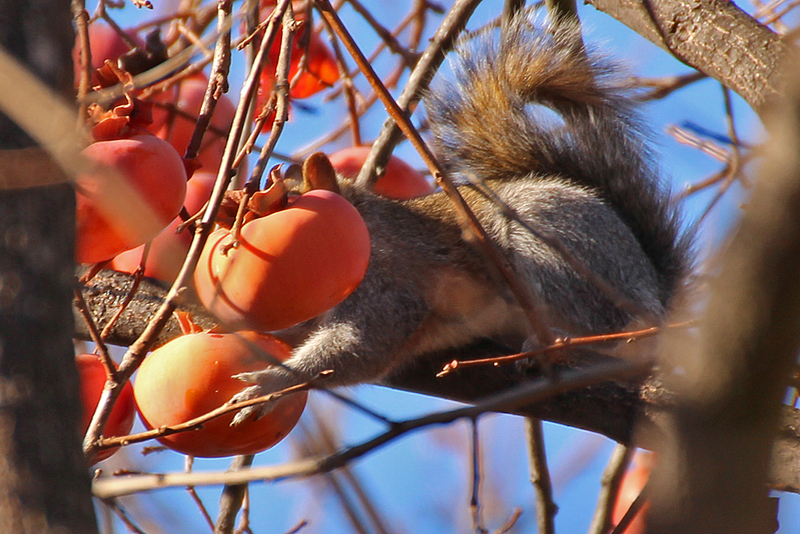 Persimmon may be an acquired taste for some (humans), but the animals love these juicy orange fruits. I found a variety of birds feasting on the semi-rotting pulp, as well as a gray squirrel. 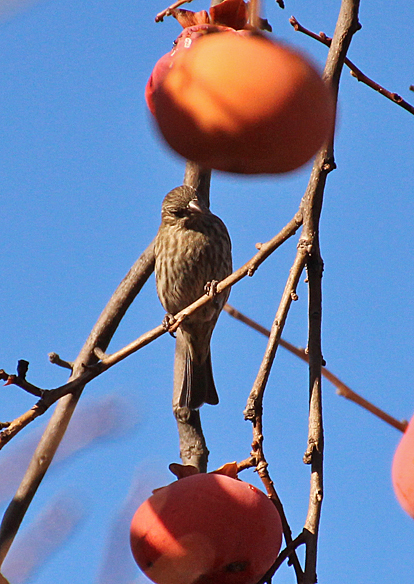 A female (or juvenile) House Finch inspects the fruit to determine which one to peck. 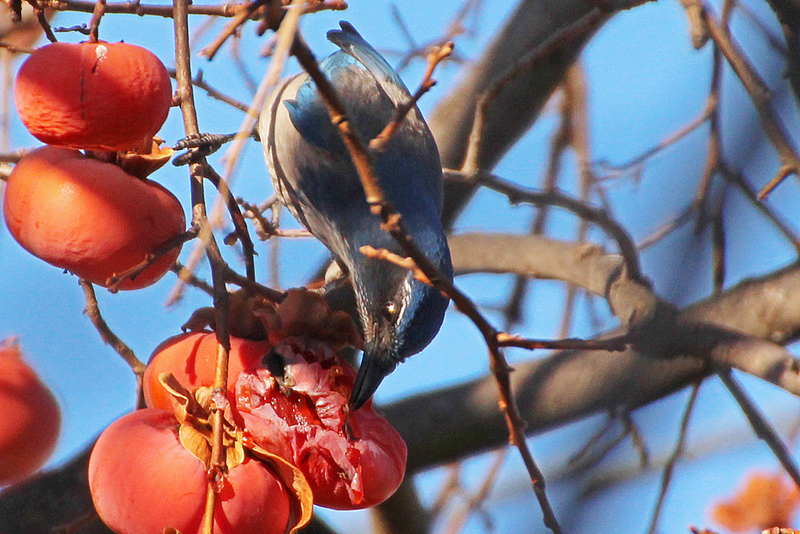 The sharp chisel beak of a Scrub Jay can open up these fruits so other birds can feed on them. 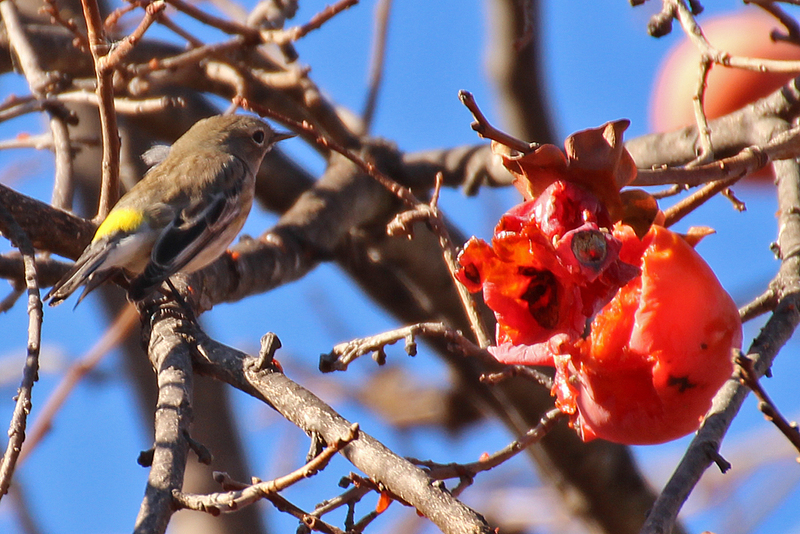 A flock of Yellow-rumped Warblers swarmed the fruits, digging into the gaping cracks in the fruit left by larger-beaked birds. 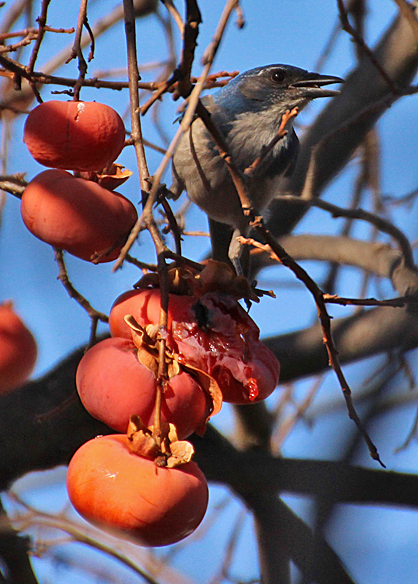 Mockingbirds, and even Anna Hummingbirds, made their rounds through the persimmon tree for a bite of fruit or a stray insect attracted to the rotting fruit. But the major consumer (by volume and time spent snacking) was the Gray Squirrel, who grabbed the fruit with his front legs while stuffing his head deep into the fleshy interior. Can’t get enough of this good stuff. Persimmon is originally from China, but is grown all over the world. I love them, but many people don’t because of their astringent skin that imparts an unpalatable “furry-ness” to the fruit if not peeled correctly. However, the fruit has a high glucose content (a whopping 33.5 g sugar/100 g fruit), so it provides quick energy to hungry animals. Like many fruits, it is low in protein content (only 0.8 g/100 g fruit), although perhaps birds supplement their protein by eating the insects that are also attracted to the fruit’s exposed fleshy interior.